With the third disc we move into the 20th century. Gordon Jacob's Concerto for bassoon and strings was written in 1947 and premiered by Archie Camden, the BBC Symphony Orchestra and Adrian Boult. Here it is performed by Thompson with the English Chamber Orchestra and Geoffrey Simon. By turns playful and serious, it is an attractive work which deserves more outings. John Downey (1927-2004) was a name new to me. His The Edge of Space: Fantasy for Bassoon and Orchestra was written in 1978, and here performed by Thompson and the London Symphony Orchestra conducted by Geoffrey Simon in a recording from 1980. It is an imaginative single movement work full of interesting textures for bassoon and orchestra. The last work on this disc is by Juliaan Andriessen (son of the Dutch composer Hendrick Andriessen). Mainly associated with music for film and theatre, Juliaan Andriessen's style is eclectic. His Concertino for Bassoon and Wind Ensemble dates from 1963 and uses a double woodwind quartet. The result is dark with neoclassical tinges. It was recorded in 1980 by Thompson and members of the English Chamber Orchestra. The final disc starts with Arnold Bax's Threnody and scherzo for bassoon, harp and strings written in 1936, originally for string sextet but here using string orchestra to create something atmospheric and rhapsodic. Thompson recorded it in 1990 with harpist Karen Vaughan and strings of the London Symphony Orchestra conducted by David Amos. Thompson commissioned John Downey's Quintet for Bassoon and Strings, a substantial three movement work which he recorded with the Fine Arts Quartet in 2002, the most recent recording on the disc. Finally we return to one of the classics of the repertoire, Mozart's Bassoon Concerto here recorded live with the Milwaukee Chamber Orchestra, conductor Stephen Colburn in 1990, a fine testament to Thompson's art even if the accompaniment sounds a bit stiff at times. 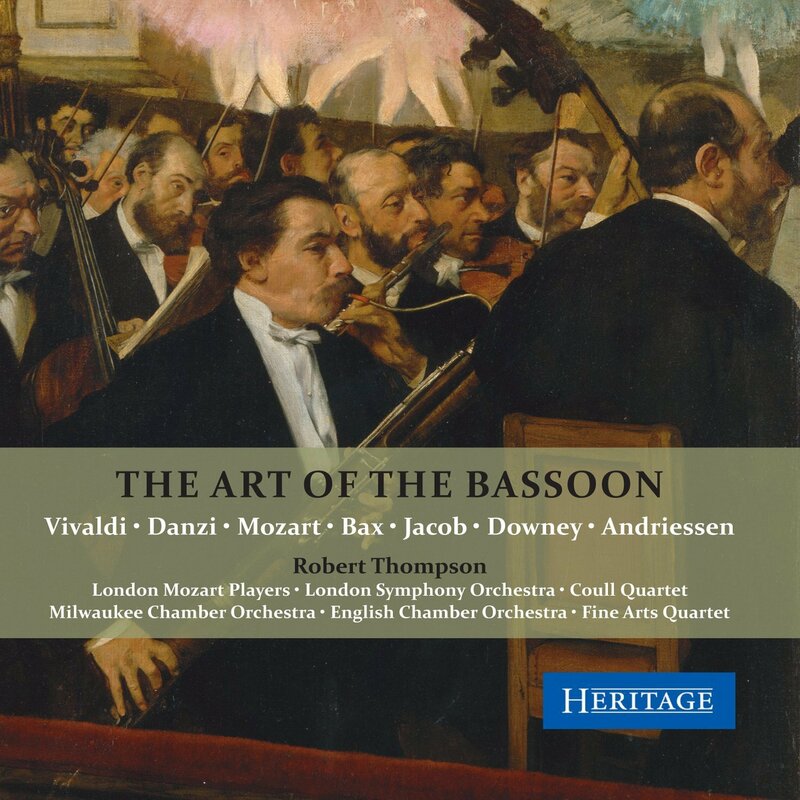 Robert Thompson was an important advocate for the bassoon as an all round soloist, as he played classic repertoire as well as discovering new and commissioning pieces. None of the recordings on this disc would necessary make it onto the library shelves, but as a testament to Thompson's art the set is a fine document.